This was how my chin looked like before the procedure. It was so crooked and didn’t align with my jawline at all. The photo above shows how my chin looked like before the procedure I'm about to explain. Basically, too much Hyaluronic Acid was injected to my chin by (probably) an untrained professional, hence the unexpected outcome. I made a trip down to SL Clinic where I met Dr. Kelvin Chua for a consultation. 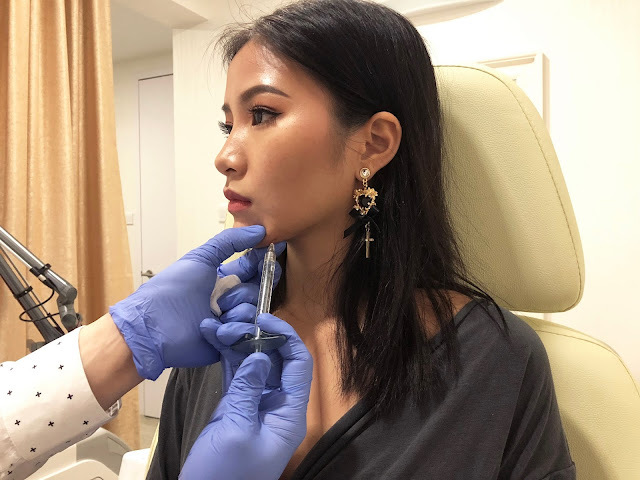 After a thorough examination of my chin, he suggested dissolving the remaining filler with Hyaluronidase and then letting it rest for a week before filling it up again with the proper amount and techniques. Without any hesitation, given that Dr. Kelvin Chua has years of experience in this field, I agreed. Prepping the injection site with numbing cream. Hyaluronidase is an enzyme that exists in our bodies. When injected, it dissolves the filler (Hyaluronic Acid) immediately, though it will take 24 to 48 hours to see the full results. I'm not going to lie; it is actually pretty painful hahaha. I would give it about an 8 out of 10, but no worries, the sensation only lasts for a couple of seconds. And that is why it is very important to choose an experienced doctor with your aesthetic needs from the very beginning! That way you never have to worry about fixing anything if they're already done right. The entire procedure really only took about 5-10 minutes, and the results were almost immediate. I could already see a difference within the next 5 minutes or so. But of course, it took about a day for everything to fully dissolve. Some patients may experience swelling around the injected area, however I did not. Here is how my chin looks like a week after. A week later, I found myself in Dr. Kelvin Chua's office for a review. He pointed out the reasons why my chin fillers looked too artificial before and fixed it by injecting only a minute amount of Hyaluronic Acid. I love how natural looking it is now! No more dents in my jawline. Also, no more comments on my Instagram photos by random people about how my chin looks weird. LOL. Injectable fillers for men and women in Dubai, Abu Dhabi are highly used as lip plumper, wrinkles removals & many more aesthetic purposes. Best fillers clinic in Dubai & Abu Dhabi. Get rid of pimples with dermal injections or Fillers in Dubai. I have allergic skin, i cant use any cosmetic on my skin, i want Fillers treatment for my lips, it create any side effects on my skin, can i use this treatment or not.